The time was summer of 1994/95. The place was Southern Cross University. 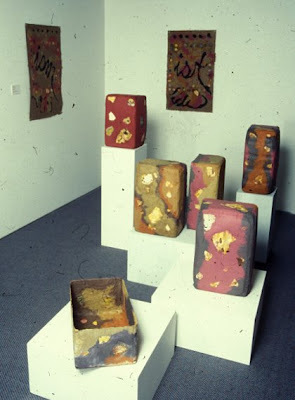 In the summer of 1994/5 I worked withSantiago Bose on a paper making project that culminated with the exhibitionJournals of a Cultural Drifter at Southern Cross University Art Gallery. Bose pioneered the use of indiginous materials and this was a focus in the workshop. Some of Santiago's work can be seen here. The project was for me an opportunity to learn about paper making, a subject that had intrigued me for most of my life. It has been an ongoing project for me since it started a passion for paper making and works on paper. Santiago's approach to paper making and art left apermanent impression on my own practice. I couldn't have had a better starting point as a paper maker. 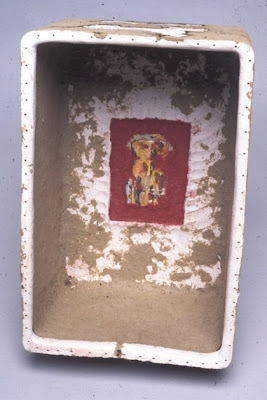 For my part in the project I made my Bad BoyBoxist series that included some ceramicThong(s) in a Matchbox. This is where the 10/4 thong was born. I had to utilisepaper clay to be able to roll out the straps to be thin enough so as to remain flexible without drying out. 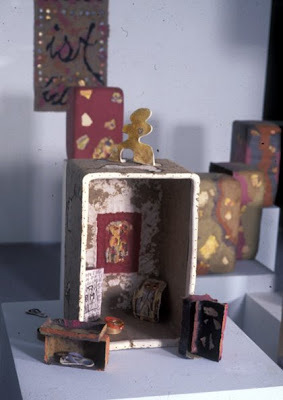 This was a realisation for me at the time as I had always concidered paper clay as a medium for large work. My ceramic thongs were used in my instalation in the exhibition and published as a multiple to celebrate the occasion.